What do our first impressions convey about ourselves? 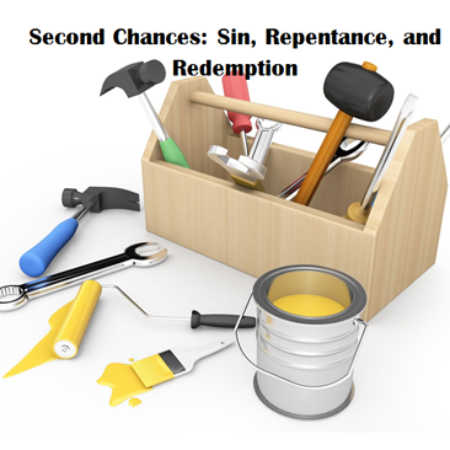 This is our last Sunday of exploring second chances: sin, repentance, and redemption. We have looked at how we need sin for our hope, each and every one deserves a second chance, and how we can turn around and turn again. We conclude today with a second chance for a first impression. In our Gospel lesson today, we find Jesus illuminated and transfigured, changed right before the eyes of the disciples. It is not the first time that Jesus has surprised them; he has a habit of doing that regularly. However, in this surprise, they heard the voice of God. They heard God bringing blessing for Jesus and for all of them as God instructs them to follow Jesus. Surprise and confusion, shushing and hushing as they move from experiences of God to healings and teachings, the disciples are still forming their impressions of Jesus. Who is this man who walks among us, but seems to be completely different? Who is this man that God claims as God’s own? It was Will Rogers, cowboy, actor and humorist, from the turn of the previous century who informed us that you never get a second chance to make a first impression. While he made it quippy, most of us already knew this. Each of us who has woken up on the wrong side of the bed and said things that we should not have, know this. Each of us who can recall moments in high school when we wanted to impress someone we saw from across the room with our cool, calm, and collected ways, and then fell all over ourselves with words we didn’t mean to say and things we didn’t mean to do. Our first impressions are often not the best of us. First impressions often find us hiding parts of ourselves that we think are undesirable. And we make snap judgments of others that do not capture the fullness of who they are in the snap second decision that we made. We only see the woman who cuts us off at the grocery store as angering us and showing a lack of respect. We do not see the frightened mother who has no answers for the diagnosis that her son was given a mere hour ago at the doctor. We only see the angry man yelling on his phone. We do not see a friend advocating for justice for other neighbors who have been bullied and abused by hurtful practices. First impressions and snap judgements do not always make through evaluations of character and relationship. We need the opportunity to re-evaluate. It is not just a big eraser in the sky that makes it all better. Our opportunities for a second chance at ta first impression with God is the actions that we take based on the life and teachings of Jesus that bring us into reconciliation with God. New life is not only possible, but is the primary method of transformation that God uses in our lives. New life is when we transition from a malcontented grumpy person to one who begins to see joy and possibility. New life is when we transition from pointing out only failings to seeing where God is moving, even in the midst of brokenness. Our God is a God of second chances. God’s grace in salvation is that you and I get a second chance at a first impression. For each and every one of us who messed up but good. For each and every one of us who is still beating ourselves up over the actions of our youth, the mistakes of our past, and the impressions that we wish we could un-do and re-do. For each every one of us who need a second chance to a first impression. The prophet Isaiah speaks to the people of Israel who have messed up time and time again. The prophet speaks to the people who have been oppressed and downtrodden. The prophet speaks to those who have just never quite gotten it straighten out in a new land, where others are calling the shots and they are not sure how to assert themselves in faith. The prophet Isaiah reminds the people that they are God’s people. The prophet Isaiah speaks to us! We are God’s beloved. We have spoken of sin as missing the mark as in archery. Barbara Brown Taylor extends the metaphor of missing the mark to include a sewing needle. She suggests that by the grace of God she has been mended AND God is calling her to be a mender too. “Day by day our job is to hunt the places where the world is ripped and bend over the damage to do what we can do. Every good deed, every kind word, every act of justice and compassion tugs the torn edges closer together. The truer our aim, the smaller our stitches and the longer our patch will hold. We made plenty of rips ourselves, and some of worst ones show evidence of having been mended many times before, but that does not seem to discourage anyone. Mending is how we continue to be mended and we would not trade the work for anything.” God has already given us second chances at first impressions. God has already offered us the gifts of grace and reconciliation. God is already working ahead of us to make our blunders mended into the fabric of our lives. Our second chances are not only to assuage our un-comfortabilities of saying the wrong thing or tripping over our own feet. Our second chances are God redeeming us and calling each of us by name. Our second chances are God’s love illuminating us so that we can reflect God’s light for others. Our second chances are our redemption and the another one’s hope. Sunday: “But now thus says the Lord, he who created you, O Jacob, he who formed you, O Israel: Do not fear, for I have redeemed you; I have called you by name, you are mine.” Isaiah 43: 1. In order to be redeemed, one is saved from something undesirable and sometimes, harmful. Where are you calling God to save you? Monday: “When you pass through the waters, I will be with you; and through the rivers, they shall not overwhelm you; when you walk through fire you shall not be burned, and the flame shall not consume you.” Isaiah 43: 2. Each and every trial was not sent by the Lord, but is used as an opportunity for redemption. Where is God redeeming you? Tuesday: “Because you are precious in my sight, and honored, and I love you, I give people in return for you, nations in exchange for your life.” Isaiah 43: 4. You are precious in the sight of the Lord. How can you treat others as precious in the sight of the Lord? Wednesday: “Everyone who is called by my name, whom I created for my glory, whom I formed and made.’” Isaiah 43: 7. Every one, all of God’s, are beloved. Where is God calling you to notice others as God’s called? Thursday: “Six days later, Jesus took with him Peter and James and John, and led them up a high mountain apart, by themselves. And he was transfigured before them” Mark 9:1. Transfigured is to be changed in appearance. Jesus was transfigured to show his appearance as God’s son. How are you showing being God’s child? Friday: “Then a cloud overshadowed them, and from the cloud there came a voice, ‘This is my Son, the Beloved; listen to him!” Mark 9: 7. God calls each of us, beloved. Can you hear God’s naming and blessing? Saturday: “Suddenly when they looked around, they saw no one with them anymore, but only Jesus.” Mark 9:8. Prayerfully spend time giving thanks for Jesus being sufficient for all our needs.